The most in-depth investigation of the Titanic disaster yet. The recent 100th year anniversary of the sinking of the RMS Titanic has spurred interest in that famous “night to remember” to an unprecedented degree. 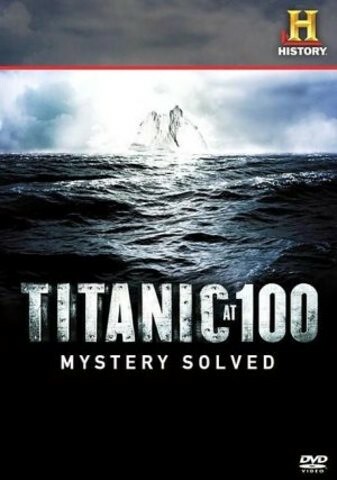 The new History Channel DVD Titanic at 100: Mystery Solved documentary takes us on the most exhaustive investigation of the shipwreck yet. And as the title purports, they actually do solve the mystery of what really happened the night of April 12, 1912. The question posed at the outset is a simple one; “Did the Titanic have a fatal flaw?” There has been a lot of speculation over the years over what actually happened. The theories basically boil down to two possibilities; that the ship was constructed out of inferior metal or that the rivets simply did not hold. There have been a number of deep-sea investigations of the Titanic, the most famous of which was in 1985 when it was discovered that the ship actually broke in half when it sunk. On the ocean floor, the bow and the stern landed one-half mile apart, facing each other. Previous expeditions have focused extensively on both of these large segments of the mighty ship. And there was clearly a lot information contained within their frozen-in-time remains. But for a real explanation of what actually happened when the Titanic hit the iceberg, the middle section is the essential missing ingredient. The key to the reason Titanic at 100 is such a compelling program is the scope of the investigation. The ship’s debris covers an astonishing 15 square miles on the floor of the Atlantic Ocean. For the first time ever, a robotic camera has been employed to photograph every inch of this terrain. With the use of high-powered computers, and three-dimensional technology, the team were able to piece together the scattered remains into a first-time ever reconstruction of the ship. It is an amazing achievement, and with this template the investigators are finally able to pinpoint exactly where the iceberg hit, and what happened afterwards. One of the most prevalent theories about why the ship sunk so quickly was that once one of the rivets popped, the rest followed. This so-called “domino theory” made sense on paper. If the force of the impact was enough to blow out one rivet, and the rest followed suit, then obviously a huge hole would emerge. Curiously enough however, this thesis has never been tested. The History Channel team recreates the circumstances for us in the lab, with surprising results. By taking a riveted piece of metal identical to that which was used on the Titanic, and applying the amount of pressure to it that the impact with the iceberg would have exerted, we see firsthand that while one rivet does pop, the rest do not. In fact, what happens is that the resulting energy is spread out evenly between the remaining rivets, and they hold fast. Besides the “rivet theory,” the other hypothesis that has gained a fair amount of traction is that the new seams that were applied in the middle area of the ship were made of inferior metal, or that the seams themselves were faulty. This idea is also proven to be unfounded, as the photographic evidence clearly shows. As we see from the broken pieces, the seams themselves held fast, and remain completely intact in their final resting place. So how is the mystery solved? As it turns out, there really isn’t much of a mystery here at all. The conclusion the team comes up with is that the force of the iceberg was just too great for the RMS Titanic, or any other ship to absorb. I guess you could blame the iceberg, but the real solution here really comes down to the fact that a different route should have been chosen from the outset. “Unsinkable” was a mighty powerful sales tool, but in the end, that is all it was. Just think of all the technological advances in the past 100 years, yet we still have been unable to build an unsinkable boat. Just flash back to the Costa Concordia cruise ship sinking on the Italian coast for a recent example. In the films A Night To Remember (1958) and Titanic (1997), the lack of enough life-boats for the passengers is shown to be a major component in the resulting loss of life. One thing that is never mentioned however is that the Titanic actually carried more lifeboats than was required by law back then. As is explained in the documentary, the whole idea of lifeboats was not to provide a seat for every passenger. Their (pre-Titanic) purpose was to act as ferries, to carry passengers from a damaged ship to the rescue ship. The lifeboats would then return to pick up the rest of the sinking ship’s passengers and crew. It was only after the Titanic disaster that laws were enacted to carry enough boats for every person on board. Titanic at 100: Mystery Solved provides the most in-depth investigation of the wreck of the great ship yet. The piece by piece photographic reconstruction of the Titanic itself is pretty incredible, and this alone makes the program essential viewing. The “solution” of the mystery may not be very exciting, or scandalous for that matter, but it has the virtue of being true, however mundane that truth may be. The 96-minute DVD will be released June 5.